Jewish Facts From Portland: US Ensuring Israel's Safety? Our Last Chance? How? US Ensuring Israel's Safety? Our Last Chance? How? This morning's paper, the Oregonian, has an article from the Washington Post by Anne Gearan headlined, "US works to ensure Israel's safety." In it we are told that the US is trying to establish new ways to guarantee Israel's security in the event that it no longer occupies the West Bank (Judea and Samaria). Doesn't the USA realize that this has already been discussed in the 1993 Oslo Agreements and that there are 3 sectors in Judea and Samaria, section A, B, and C. Israel is allowed to settle in sector C which is 61% of the area and includes the Israeli towns and is under Israeli control Sector A is 11% of the land and is under the Palestinian Authority. Sector B is 28% of the area and the Israeli military and the Palestinian civil authority control this area. East Jerusalem is now part of the rest of Jerusalem and is Israel's capital. It is not a part of the West Bank, even though Abbas wants to make it his capital. This tells me that something is brewing to finagle all of Judea and Samaria away without batting an eyelash and make it Judenrein, which is the wish of the Palestinians. It remains a wish only. There has been no negotiations due to the decisions the Palestinians demand BEFORE they sit down to talk to the Israelis. Has Kerry fallen into their trap? It seems more that the USA is trying to placate Israel instead of thinking of its safety. How can they possibly guarantee safety in the first place? Only Israel can do that as it's always only Israel's IDF that is involved. On the other hand, it is the Palestinians who have managed to attack Israel with the help of at least 7 Muslim nations who have attacked her all at one time. Retired Marine General John Allen has been brought out of retirement to be the special adviser to both Kerry and Chuck Hagel. He is the former commander of the NATO forces in Afghanistan. His new job is to formulate US security policy in the Israel-Palestinian negotiations. I hope he will uphold the honor of the Marines by being forthright and honest about Israel's need for defense against a hostile neighbor. Do they not realize that the motto of Hamas is: We love death as much as the Jews love Life! Have they bothered to read the charter of Hamas? Fatah has been wishy-washy about linking up with Hamas with a power play at hand. Remember, it was Hamas who kicked out Fatah from Gaza. Judea and Samaria are acting like buffers against attack on the center of Israel and are necessary. By becoming a tight line of Hamas-Fatah into Judea-Samaria moves the danger closer than Jordan is, where the last attack came from in 1967 when Israel won the battle against all odds. It sounds to me like they're going to try to find holes in Netanyahu's feelings about what Israel needs for security. I believe only Netanyahu and his Generals know for certain what works and what doesn't work to protect Israel, not even an American General who hasn't been involved in this defense line, even though he is a respected general. 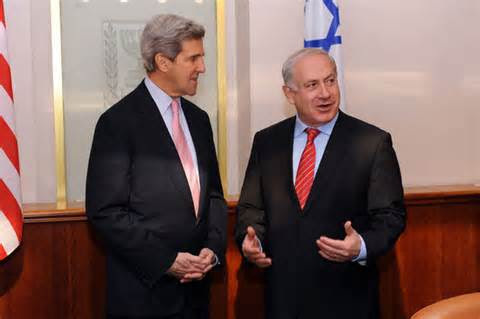 Show a little respect for Israel's knowledge, please, Mr. Kerry. It's nice to have the opportunity to consult with an American General, but that's it. It shouldn't be the last word. It is better than going by Kerry's knowledge of war and security, though. It's good that he is going to listen to some experts. The article goes on to say that the goal is to remove potential deal-breakers at the outset of the push for new talks before they can spoil what Kerry calls a last chance for peace between Israel and the Palestinians. Is this forewarning another attack on Israel? Possibly allowing Iran to attack by not stopping Iran's ability to make nuclear weapons? Is this a threat saying, you either comply by giving up Judea and Samaria or we won't do a thing about Iran? Pardon me if I sound paranoid, but I've found out too much about my lovely country and spies and what happens between nations and especially how Israel and Jews have been treated throughout the ages. I've gone from a naive teenager to an extremely wary grandmother. The talks between Abbas and Netanyahu have been dead for the past 5 years due to the stubbornness of Abbas. Netanyahu has wanted to talk peace without any preconditions to start with. He even begged Abbas to come talk when they were both in the UN for a meeting. It was seen on TV. There was no response. A USA official stated that the purpose is not to take issues off the table but to drive a deeper examination of a range of issues so all parties can see what options might exist and to see if common ground can be found. It still sounds threatening to me. The common ground, possibly of wanting peace, is not in the charter of either Hamas or the Muslim Brotherhood. It is only the desire of Israel to have peace being it's been 65 years and the Palestinians haven't come around yet. Is there unity between Hamas and Fatah? How can Abbas sit down when he isn't the representative of both Fatah and Hamas? Maybe they're waiting for the 100th anniversary of Israel to sit down and consider peace. Another day; another American dollar.